Many times I’ve been in Silverton, Colorado, and have wondered what that strange road was across the way. Yesterday, I found out. It leads to Kendall Mountain, or, more properly, the basin underneath Kendall Mountain. But first, how to cross the river? 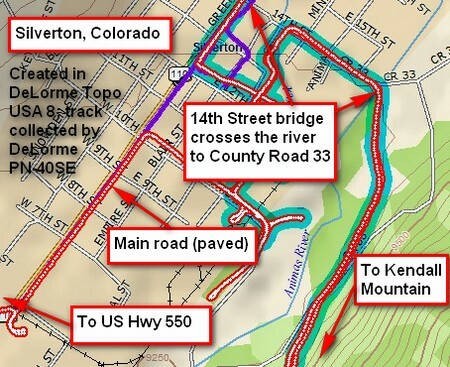 I tried several ways and found that there’s a bridge on 14th Street that leads to the base of San Juan County Road 33, Kendall Mountain Road. Cross the Animas River via 14th Street. Bear right after crossing. Here's where you want to be to start up Kendall Road. The initial part of the road isn’t that bad and the ascent not that steep. The road is quite bumpy due to rocks embedded in the road surface, but the scree is yet to come. After you’ve gone up a ways, you can look across the valley at US Highway 550 on the other side of the canyon. That's US Highway 550 across the gorge. You can just make out a white bus on the right with several cars caught behind. Here's the GPS track for Kendall Mountain. The northern of the two forks is (in my mind) a nasty piece of work. The south fork is far easier and (in my mind) a nicer ride. I took the left fork first. I encountered scree a little bit at a time. Thinking (stupidly) that the scree just might lessen right around the next corner, I kept on going up. There were spots where there was no soil—just scree. I finally made my way to the top, or at least as high as I was going. There were a further couple very short switchbacks going up a couple hundred feet to a mine adit (entrance). The switchbacks were snow-covered in some cases. That didn’t stop the 4-wheeler shown in the image from trying, though! Here's a couple folks atop a four-wheeler, about to make an attempt to cross that snow. I watched for awhile as they made several more attempts. They hadn't yet crossed it by the time I left. Here's what you see from the end of the north fork of Kendall Mountain Road. Kendall Mountain itself is to the right. That road going up is another fork that I didn't attempt. All the roads are dead ends—nothing crosses the peaks. Ah, what goes up must come down. I’ll tell you, by this time I was pretty tired. I’d already been over Corkscrew Pass and then up this steep road. I wasn’t all that graceful going down, and on one corner, almost all the way back to the main fork, I was simply going too slowly around a corner and fell. I didn’t hurt anything (me or the bike), but it reminded me to keep my speed up. On another steep, scree-filled switchback, I was going faster (8 mph?) and hit a rock really wrong. The steering wobbled all over the place, but I stayed upright, rather amazed that I’d done so. When I got to the fork, I opted to follow the south fork. This road features much less scree and is not nearly so steep. Much of it travels through “primeval” forest: dense, tall conifers. Very pretty, really. I followed the road into a meadow. There was some scree, but it’s not a problem on level ground. But as the road became steeper and the scree more common, I simply turned around. What's this doing here? It's an old railcar, sans trucks, and in mighty sad shape. Oddly, someone has perched a shovel near the entrance. Old structures like this are best photographed from the outside—going in can invite trouble. The road down from there isn’t bad. As you can see in the next photo, by the time I stopped to look at this great view of Silverton, the road itself is bumpy with embedded rock, but not so much scree. All in all, I’m glad I went. If I go up again, I will certainly take the right fork. I would rate the road as intermediate except for the left fork, which I’d rate high intermediate, about what my skill level is if I’m not tired. Nice view of Silverton down there. At this point the road is rough but most rocks are embedded with not too much scree. I don't mind embedded rocks—they don't move when I ride over them.